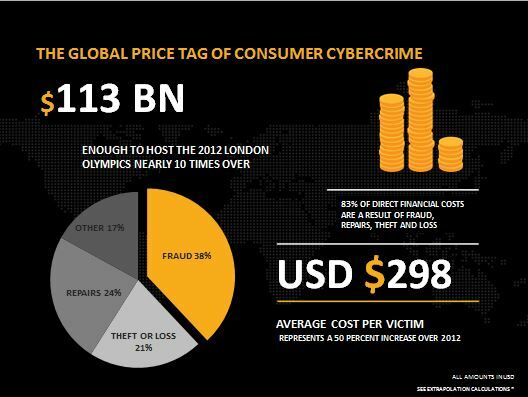 Symantec issued 2013 Norton Report, the annual research study which examines the consumers’ online behaviors, the dangers and financial cost of cybercrime. Symantec has released the 2013 Norton Report, the annual study of evolution of principal cyber threats in the security landscape. The study presented concerning results on the constant growth of cyber criminal activities. The 2013 Norton Report revealed that despite the number of online adults who have experienced cybercrime has decreased, the average cost per victim has risen. 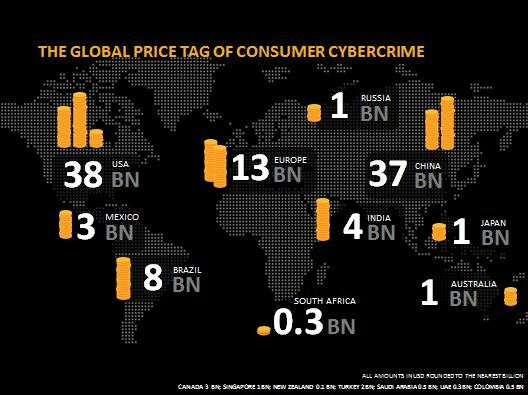 The global price tag of consumer cybercrime is S$113 Billion annually, cost per cybercrime victim up 50 percent, the data is worrying considering the actual global economic crisis. The cybercrime has no boundaries despite the large number of victims is concentrated in Russia (85%), China (77%), South Africa (73%), the annual number of victims has been estimated in 378 MILLION producing the major price tag of consumer cybercrime in USA ($38 BN), Europe ($13 BN) and China ($37 BN). The 2013 Norton Report states that lack of efficient authentication mechanisms and defense mechanisms are the primary causes of incidents for mobile users, almost 1/2 don’t use basic precautions and 1/3 was a victim of illegal activities last year. Unfortunately only a small portion of mobile users (26%) has installed security software and 57% aren’t aware of existence of security solution for mobile environments, these numbers explain why mobile is so attractive for cybercrime. It must be considered that 49% use personal mobile devices in workspace with serious repercussion of security of businesses and enterprises if consider that 36% revealed that say their company has no policy to regulate this aspect. “If this was a test, mobile consumers would be failing,” “While consumers are protecting their computers, there is a general lack of awareness to safeguard their smartphones and tablets. It’s as if they have alarm systems for their homes, but they’re leaving their cars unlocked with the windows wide open.” said Marian Merritt, Internet Safety Advocate, Symantec. Social media are considered another relevant source of problems due risky behaviors of users such, 12% of the users revealed that someone has hacked their account. The 2013 Norton Report shows that in 39% of cases users don’t log out after each session and 25% share social media credentials and one in three accept request form unknowns. These risky practices are very dangerous and are considerable as the primary cause of the increment of cyber attacks, on the other side cyber criminals are adopting hacking techniques even more sophisticated. “Today’s cybercriminals are using more sophisticated attacks, such as ransomware and spear-phishing, which yield them more money per attack than ever before,” said Stephen Trilling, Chief Technology Officer, Symantec. I suggest the reading of the 2013 Norton Report, very interesting is the economic impact of cybercrime, I found believe that the study lack of details of the methods of attacks adopted by cybercriminal ecosystem, an information that in my humble opinion is very useful to better qualify the evolution of cybercrime.